Constructions using the Rhodipor Ecobuild ICF will create an energy saving measure of both consumed and embodied energy. The thermal mass and airtight construction of the system ensures buildings remain at a constant temperature; warm in winter and cool in summer. Resulting in significant energy savings on heating and cooling systems. 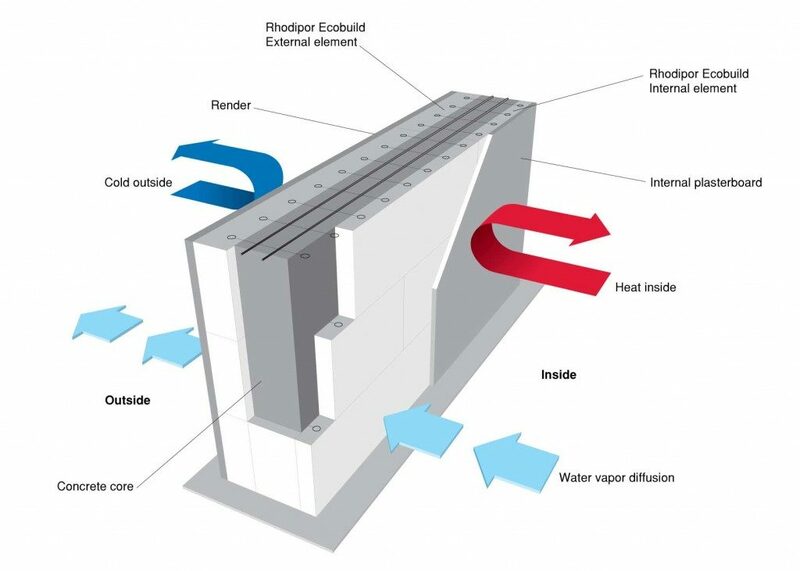 Rhodipor Ecobuild is an insulated concrete formwork ‘ICF’ building system. The walls are constructed from two panels of polystyrene forming the inner and outer sides of a wall. The outer panel is the thicker of the two and varies from 50mm to 300mm in width with the internal panel remaining a constant 50mm. The differing widths allows builders and designers the flexibility to achieve the necessary statutory and preferred insulating performance using the ICF system. The panels are connected with metal ties during construction to produce an insitu-formwork. During the build a space is formed between the panels producing a cavity to pour the concrete, enabling the panels to become an insulated jelly mould. The ties are insulated from the external elements by the ICF panels, to prevent a thermal bridge. Rhodipor Ecobuild ICF system standard width of cavity is 142mm, however this could be increased to 192mm, making this an ideal process for basement and swimming pool wall constructions. In such instances structural steel would be required within the cavity and an engineer would simply be able to verify the requirements necessary. Once set, the concrete provides the necessary structural integrity to the walls whilst Rhodipor Ecobuild ICF provides insulation for heating and sound requirements. Completed, the building is a comfortable and controllable environment for those that live, work or play within.